Many professional people who provide services set up a separate entity to run their business, be it a trust, partnership or incorporated company. The purpose, of course, is the lower tax rate that these can secure, rather than at the top marginal tax rate that an individual would generally wear. Running a business through such a structure can also lead to a wider range of deductions being available, depending on circumstances. So, to stop taxpayers dodging their full share of tax, the tax law has in place a set of rules for income derived in this way. The ATO has calls this personal services income. The personal services income regime taxes individual contractors on a similar basis as employees where income is derived mainly from the individual’s own skills, expertise or the provision of personal services. As mentioned, this also applies to companies, trusts, and partnerships where income is generated primarily as a result of an individual’s personal efforts or skills. The “alienation” of PSI through an interposed entity to utilise lower tax rates by treating the relevant income as being earned by the individual from providing personal services. The individual is taxed on the attributed income at his or her marginal rates. The provisions apply where the individual or interposed entity is deemed to be earning PSI. However, where the relevant individual or entity can meet one of a number of carve-out tests, the normal tax position of the taxpayer will be unaffected. That is, the PSI rules will have no adverse application. Those caught by the PSI rules are specifically excluded from being treated as employees for any other purposes under Australian law. However, PAYG withholding obligations are imposed on any interposed entity that is subject to the rules. Income derived from the use of an asset cannot be PSI. 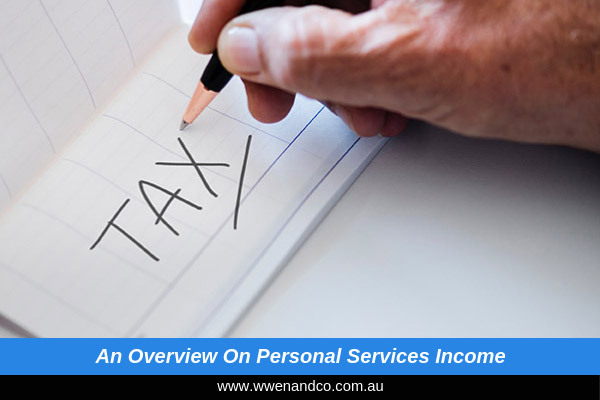 However according to the ATO, income derived from the provision of personal services involving the use of some equipment may nevertheless be PSI. Where the substance of an agreement is the provision by an individual of his or her personal efforts or the exercise of his or her skills or the production of a result from those efforts or skills, income would be regarded as PSI. Income derived as a result of a business structure is also not PSI. The ATO states that when determining whether income is mainly a reward for the personal efforts or skills of an individual or from a business structure, consideration should be given to the relative values of the efforts or skills of the individual and other inputs, such as the efforts of other workers, and the use of plant and equipment, intellectual or other property and goodwill. A taxpayer owns one semi-trailer and he is the only person who drives it. The income derived from driving the truck is not PSI because it is mainly produced by the use of the truck and not mainly as a reward for the personal services of the taxpayer. A taxpayer provides a computer programming service but she does all of the work involved in providing those services and uses the client’s equipment and software to do the work. The income derived would be treated as PSI as it is a reward for her personal efforts or skills. A taxpayer works as an accountant with a large accounting firm. None of the firm’s ordinary or statutory income is PSI because it is produced mainly by the firm’s structure and not mainly for his personal efforts or skills. To make things easier, and to help with your tax planning for the year ahead, the ATO has made available an online “decision tool” to assist you to work out whether you will or have earned PSI, and if the PSI rules will apply to that income. Please click this link to be directed to PSI decision tool. We can probably help you with a lot of the information required. Records of payments to any employees or subcontractors. Information about what your result means for your tax obligations.